An overwhelming majority of attendees who showed up to Thursday’s Concordia Student Union General Assembly voted for a one-week strike, starting March 15. “It was definitely an interesting process, but I think that at the end of the day, the students spoke,” said Concordia Student Union VP External Chad Walcott after the vote. Walcott gave a presentation before the vote and fielded questions from students. 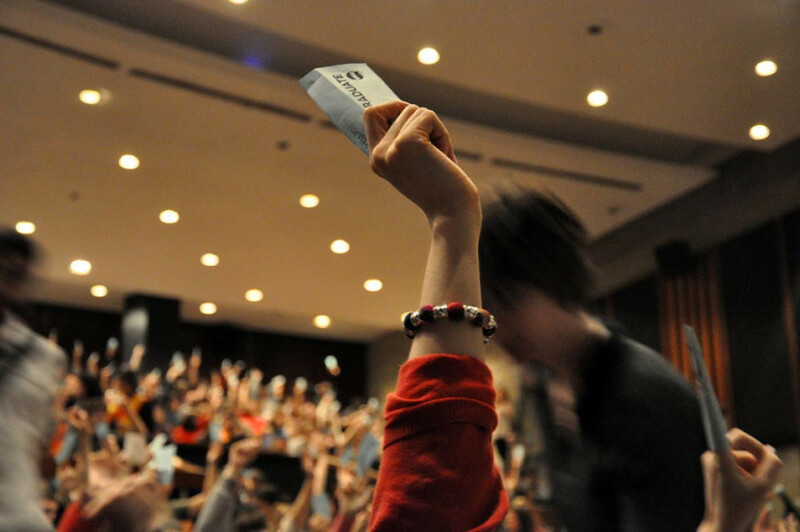 The show-of-hands vote, which took place simultaneously in the Hall Building in room H-110 and in the seventh flour lounge, as well as in the Library Building lobby and in Loyola’s The Hive, yielded 1,152 for a strike, with 557 against. Discussion preceding the vote saw two changes made to the original question. The first moved the date of the strike—which was originally set to begin on March 22—to a new date on March 15. The purpose of the change was to have it precede the presentation of the provincial budget, which had been moved to March 20. The new dates, however, coincide with the last week of campaigning for the CSU general election, polling for which begins March 22. The second motion passed was to ban the blocking of teachers and students who wish to enter classrooms. While the motion passed, Walcott stressed that, due to a lack of resources, such a motion is nearly impossible to enforce. Though discussion was generally respectful, there were a few occasions where things got heated, particularly when technical problems in broadcasting Walcott’s opening statement delayed the beginning of discussion period. While calling for open lines of communication moving forward, the email was light on two details that concerned many of the students present at the GA: the bylaws and the way the vote was conducted. Gill noted that a secret ballot could constitute a violation of the CSU bylaws, a legally binding document under the Quebec Companies Act that lay out spec ific times of the year in which a referendum could be held. Gill also added it “fundamentally doesn’t work” to show up to a GA, put a ballot in a box and leave. When asked about the possibility of an online vote, VP Advocacy Morgan Pudwell said that this option is something “the CSU has probably looked [into] least four or five different times,” but security issues have limited its implementation. “A couple of years ago the [Graduate Students’ Association] tried online voting for elections and they ended up having to annul the results because there were people going around with laptops [soliciting people to vote],” she explained. While the vote set out a strike of one week, it’s unclear what will happen on March 23 once the mandate is over. Students Cassie Smith, Anthony Garoufalis-Auger and CSU Councillor Irmak Bahar had co-endorsed a petition calling for another GA on that date, in which students would have voted on continuing the strike. In the petition, they proposed a motion which would see the strike renewed immediately if passed, and would have mandated weekly GAs be held at which students would vote on whether or not the strike should continue. However, while they had begun collecting signatures on March 9, and claimed to have 150 signatures, they have since decided to not continue with the petition. “[CSU President Lex Gill] got in touch with us this morning, and told us that there are more departments and faculties having strike votes, including JMSB and ECS, and so we felt that given that participation, it made more sense [to have votes] at the faculty level, because it would offer greater participation and more autonomy,” said Smith. Part of the agenda of the second petition included a proposal that the CSU adopt the tenets of a Minimum Agreement. It states that signees refuse to negotiate with the government unilaterally, that the lobby groups not recommend government propositions to their members so they can decide for themselves whether to adopt them, and that signees not denounce actions taken by other signees. The agreement is not endorsed by the Fédération étudiante universitaire du Québec, the union to which the CSU belongs, and the CSU Council had previously rejected signing the agreement during a meeting on Feb. 8. “We feel this is something that needs to be reconsidered, and a GA is the most democratic and membership-based way to do that,” said Smith on March 11. The next day, however, she rescinded, saying, “We’re still discussing how to move forward with the Minimum Agreement. There are a couple of other options we’re looking at,” including calling for another GA at a later date. Gill expressed support for revisiting the issue, either through a GA or at Council.